Cairns is located next to the Great Barrier Reef, on the east coast of Australia. 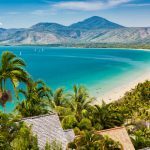 Though beaches are not part of the landscape of the city area, the proximity to the Daintree Rainforest and beaches farther north draw visitors seeking adventure and access to a wide range of day trips. Spend the afternoon on the sandy shores of a tropical island or choose to snorkel, take a cruise or try white-water rafting. Learn about Aboriginal culture or take a hot-air balloon ride. 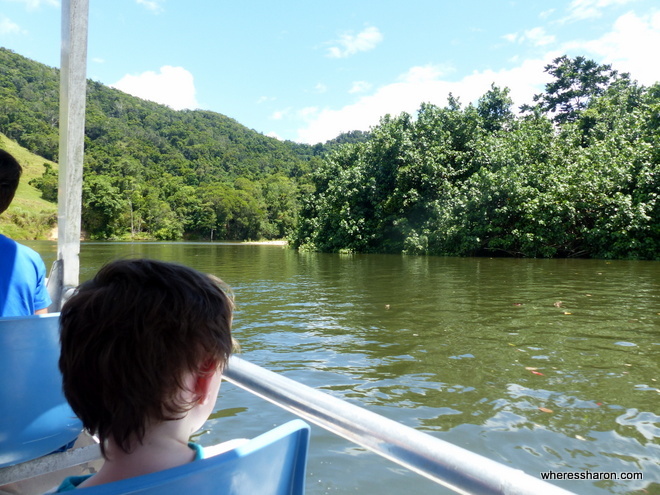 Read more about all the great things to do in Cairns with kids here and our guide to Port Douglas here. Port Douglas is about an hour north of Cairns, in Far North Queensland, and has a relaxed, tropical atmosphere. Watch the sunrise from world famous 4 Mile Beach, part of the 200 km stretch of reef and rainforest. 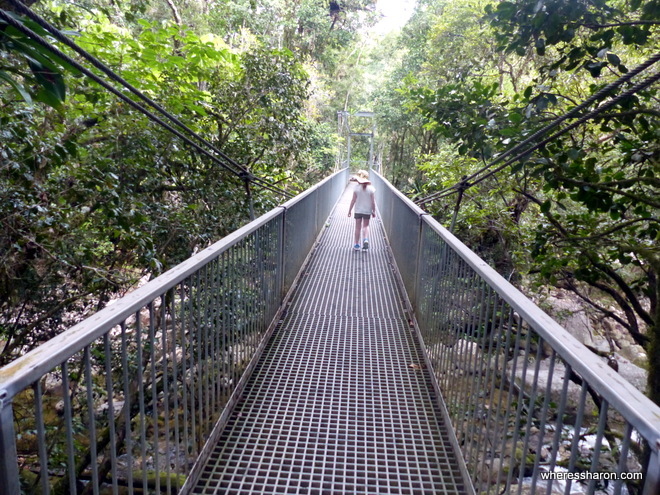 Beaches are definitely one of the main attractions in Port Douglas; however options away from the coast include the World Heritage rainforest, providing opportunities for exciting jungle exploration. 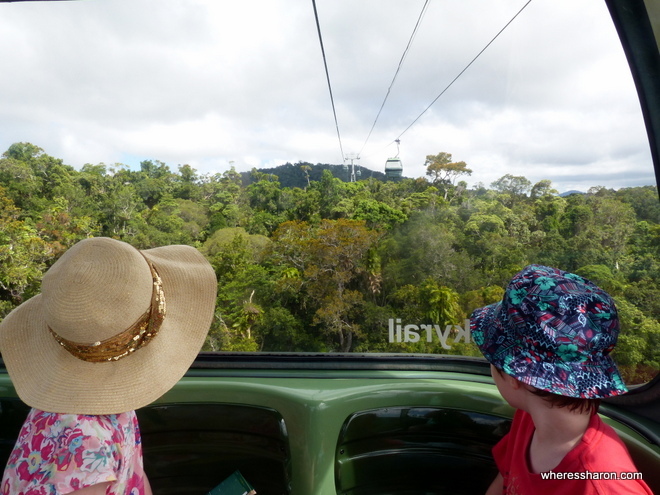 Cairns and Port Douglas are both excellent destinations for families with plenty to keep the kids busy. 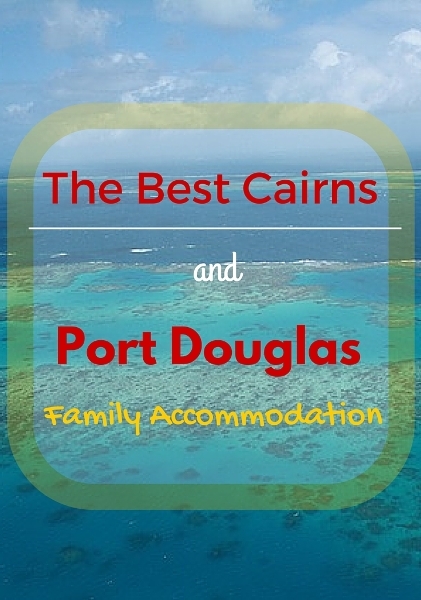 Below is our guide to the best family accommodation in Cairns and Port Douglas so you can have an awesome trip! There are three main choices of where to stay in Cairns area – Cairns, Cairns northern beaches (like Palm Cove) and Port Douglas. If you are looking for a beach resort town, pick Port Douglas. 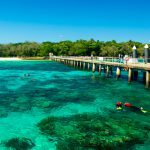 This upmarket beach town is perfect for a relaxing beach holiday and is closer to the Great Barrier Reef and the Daintress making it an even more perfect spot if these attractions appeal. 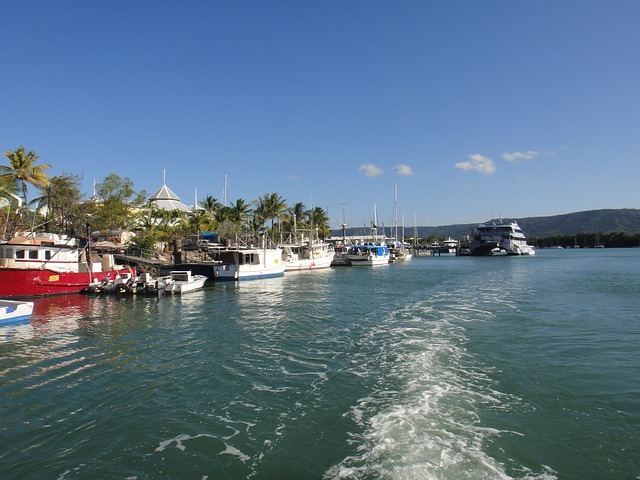 If you would rather a city area in close proximity to many fun family attractions then Cairns is a great choice. There is not a beach but there is a lovely lagoon area which may suit kids more. If you are looking for something in between, Palm Cove can be the perfect compromise. It’s 30 minutes north of Cairns and has a lovely beach area while still being on the public bus route to Cairns. 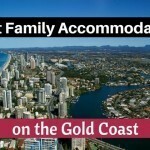 Our personal best choice for the best family accommodation in Cairns is just north in Palm Cove. 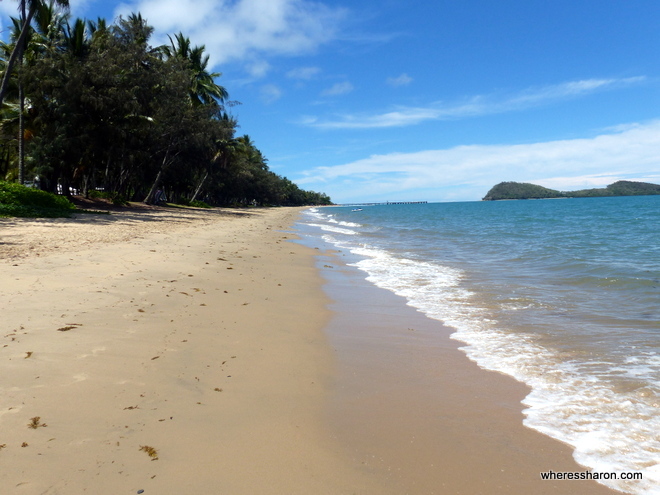 We loved staying in Palm Cove with its lovely beach and restaurants lining the road opposite it. The Villas Palm Cove is just perfect for us. It has lovely villas which are spacious and private and great for a family. We stayed in a two bedroom option (there are also three bedroom ones) which also had two bathrooms and a large open plan living with kitchen, dining and living areas. The best part, however, is the option to have a private pool. We loved our back courtyard area with a fenced off pool and eating area. The pool is a nice size and was just perfect for us. There’s also a larger pool for all guests of the resort. All of this is at a very reasonable price. Be Aware: 15 minute walk to the beach. Best For: Families who want a private pool or a spacious villa that is well equipped. Bay Village Tropical Retreat & Apartments is a centrally located boutique hotel in a setting of manicured gardens. It a suitable choice for accommodation in Cairns for families and the hotel offers a free-form swimming pool and a pool bar, as well as BBQ facilities. There are kitchenettes in all rooms and apartments, Wi Fi is included. There is a restaurant on site offering breakfast, lunch and dinner. The largest apartment can sleep up to 6 adults plus one child. Vending machines and laundry service are a few of the features of this hotel, making it a good choice for family accommodation in Cairns. Walking distance to fine dining and shopping make the Bay Village Tropical Retreats & Apartments an excellent Cairns family resort. This family resort in Cairns is in the heart of the city and offers some of the best dining and entertainment in the area. Nearby, guests will discover such attractions as the Trinity Wharf and Cairns Esplanades, all within easy walking distance. The 321 tasteful rooms and suites each feature a glass door leading on to a private balcony, and a marbled, premium bathroom equipped with all the necessities. Most rooms have 2 double beds, and some rates include breakfast. There is a coffee shop and restaurant on site. Bicycle rentals, a beautiful pool, a sauna and children’s pool provide for plenty of family outdoor fun. 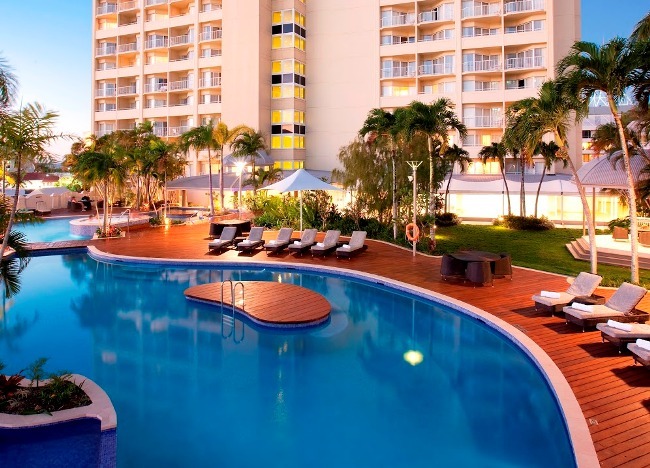 The Pullman Cairns International hotel is a good choice for accommodation in Cairns for families. 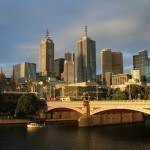 Be Aware: Wi Fi is only free in public areas – unless you join up to their free global loyalty program. Set in beautiful tropical gardens, Marlin Cove Holiday Resort is one of the best Cairns family resorts for those who are seeking apartment-style accommodation. Very close to Trinity Beach on the Cairns coast, this hotel provides easy access to many popular tourist activities. With the Great Barrier Reef just outside the door, guests are steps away from diving, swimming, snorkelling. The family friendly accommodation in Cairns boasts 55 splendid villas with free Wi Fi and private balconies that provide breathtaking views of lush gardens. The apartments sleep up to 6 and children up to the age of 12 stay free when using existing bedding. The 3-bedroom apartment can sleep up to 7 with an additional bed and features 2 bathrooms. The resort offers an outdoor swimming pool, lap pool and tennis court. 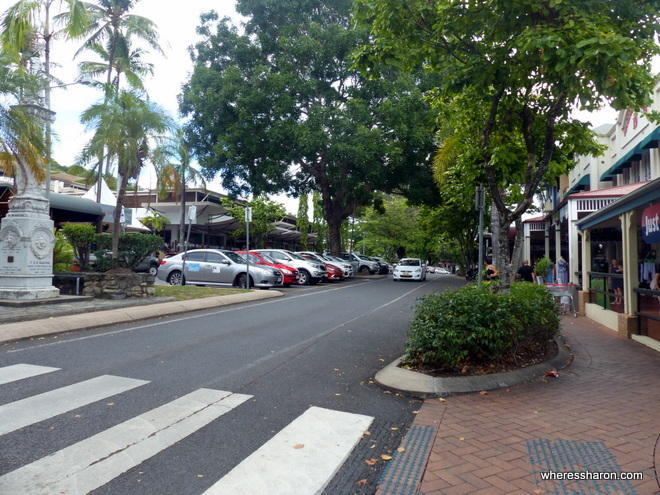 Cafes, restaurants and shopping are close by, and this hotel is a good choice for kid-friendly accommodation in Cairns. 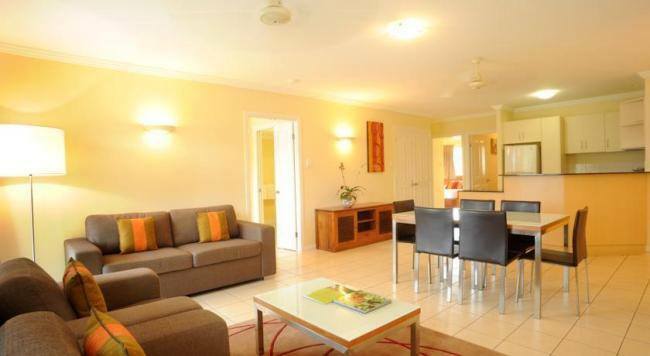 Another excellent option for family accommodation in Cairns is the exceptional Bellevue at Trinity Beach. All guestrooms feature either garden or ocean views, and the 1, 2 and 3-bedroom apartments have either a kitchenette or fully-equipped kitchen. The spacious 3-bedroom ocean view apartments have 2 double and 2 single beds. The hotel offers an outdoor lap pool, a separate children’s pool and a garden. A tour desk offers local tours and supermarkets and restaurants are within walking distance, making this hotel one of the best Cairns resorts for families. 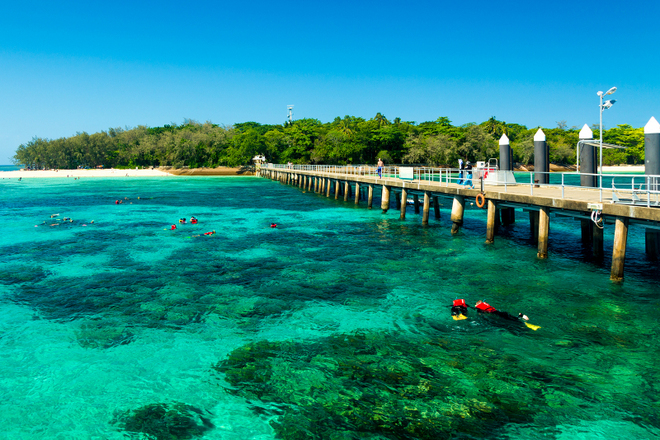 Read our full list of things to do in Cairns here. Located in South Port Douglas, about an hour from the airport, the Rendezvous Reef Resort Port Douglas offers self-catering accommodation in the form of 128 stylish villas on 15 acres of lush tropical gardens. Each villa includes living and dining areas, a fully equipped kitchen, a private patio or balcony and laundry facilities. The 1-bedroom villas feature 1 queen and 1 king bed and the 2-bedroom villas have 2 single beds and 3 queen beds. 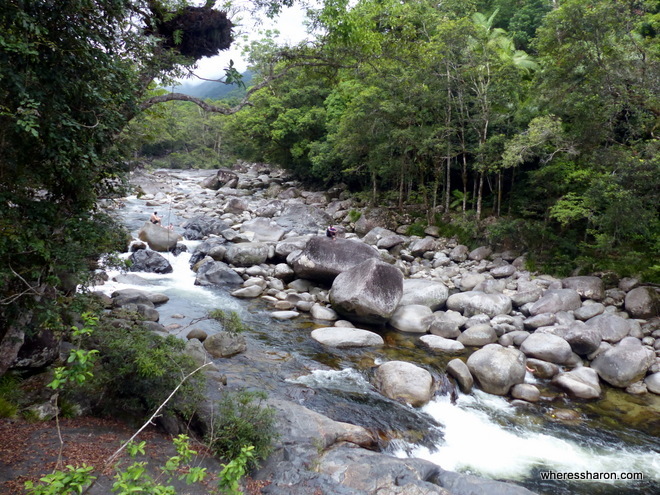 Two UNESCO World Heritage Sites – the Great Barrier Reef and the Daintree Rainforest – are within easy reach. One of the best Port Douglas family resorts, here you can enjoy your days in the resort and its two lagoon-styled pools and a variety of dining options. Located in Queensland 70 km from the airport, this hotel-style family friendly accommodation in Port Douglas offers modern studios with spa bath and tea and coffee making facilities. Outside, 4 swimming pools and tennis courts are some of the recreational facilities guests can enjoy while staying here. Conveniently located, this 4 ½ star hotel allows guests to enjoy the facilities while being close to many attractions. Rooms feature a patio or balcony. 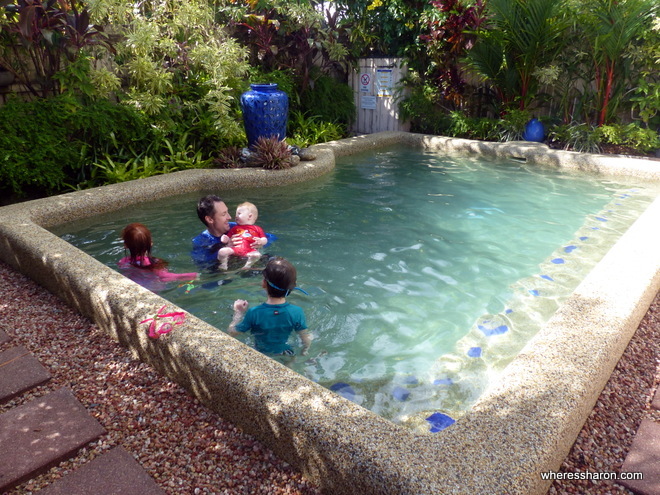 Mantra Aqueous on Port Resort is indeed an excellent accommodation in Port Douglas for families. Located just a five-minute stroll to the Four Mile beach, and a short drive to the cafes and restaurants of Macrossan Street and Marina Port Douglas, this family accommodation in Port Douglas features a lagoon-styled swimming pool with waterfall which guests can enjoy after an adventurous day trip. There is a pool-side bar and a restaurant. Guests can relax and dine at the Tree Bar and Grill, or walk to a wide variety of local dining options. This full-service hotel features a tour desk, bicycle rental, luggage storage and shuttle services. Babysitting services are available. Situated within North Queensland’s tropical rainforest, Mantra PortSea Hotel is an excellent accommodation in Port Douglas for families. The location allows easy access to nature and beaches. The one and two bedroom studio apartments offer modern facilities such as LCD/plasma TV and coffee and tea making facilities. Breakfast is included in most rates. The hotel sits within close proximity to many popular attractions, allowing guests to explore the rainforest and breathtaking beaches. Port Douglas has a wide range of restaurants and shops and you can take advantage of the location or just sit back and relax while enjoying the lagoon-styled pool, swim-up bar, spas, waterfalls, and tropical gardens at the hotel. This family accommodation in Port Douglas is a convenient and comfortable hotel close to all the attractions. One of the top family friendly resorts in Port Douglas, this tropical apartment complex features rooms and apartments with free Wi Fi and is a short stroll to shops, cafes and restaurants. Four Mile Beach is close by, for enjoying beach activities of all sorts. This family accommodation in Port Douglas is soaked in sunshine surrounded by gardens and tropical atmosphere. Each self-contained apartment has its own private balcony and a washing machine, clothes dryer and ironing facilities. A CD player and video player and free Wi Fi provide for entertainment and internet access and make this hotel very suitable for family accommodation in Port Douglas. Luxurious summery furnishings and polished oak floors and spacious dine out verandas give a relaxed feeling. There is an outdoor pool and hot tub. 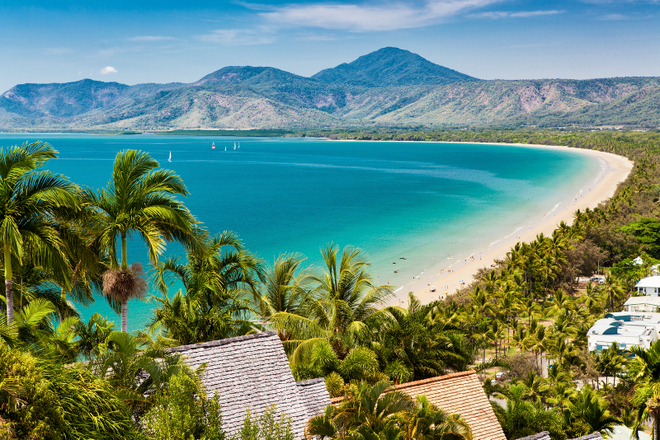 Read our full guide to visiting Port Douglas here. What is your favourite hotel in Cairns? Read our full guide to visiting Cairns with kids here. Great review guys. 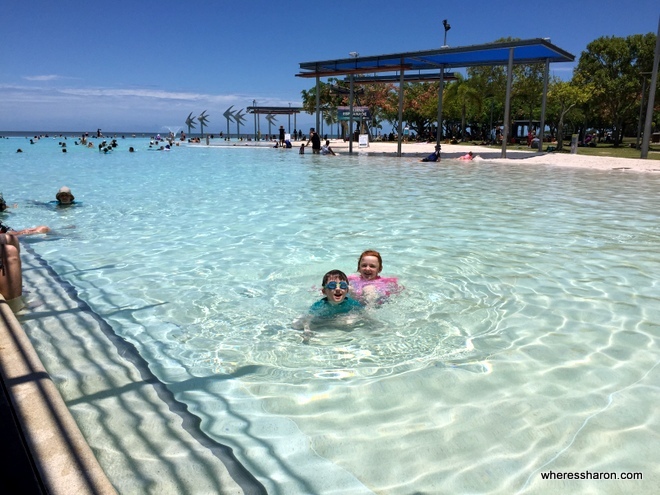 Cairns is often regarded as having the most affordable accommodation in Australia – which is always family friendly. We lived in the rain forest up there for a while and always found there was something always different to do. If you are up for a bit of a family adventure with your affordable accommodation you can also camp on nearby Fitzroy Island. Look forward to reading your great reviews on your home state of Tasmania soon. Hi guys, nice blog. 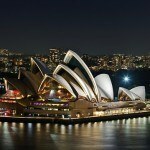 I want to know how can I go to Australia for vacations. I am cuban and I would like to obtain a temporally visa, do you guys know how I can make it??? Thanks.